Leupold 58450 FX-II 2.5x20mm Ultralight Riflescope FREE SHIPPING! Never miss another bullseye with the help of the FX-II 2.5x20mm Ultralight Riflescope from Leupold. Boasting an ultralight construction that weighs 17 percent less than its full-size counterpart, the FX-II offers greater mobility without sacrificing functionality. Its multicoated lenses are precision cut to offer the highest level of light transmittance possible. This results in clearer images with greater contrast that deliver a more visible sight picture regardless of lighting conditions. The riflescope's ruggedized body is designed to withstand the extreme conditions inherent of tactical field work. It is shock resistant, O-ring sealed and nitrogen purged for waterproof use under the harshest environmental conditions possible. 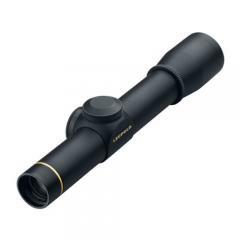 ©2002-2019 CopsPlus.com: Leupold 58450 FX-II 2.5x20mm Ultralight Riflescope FREE SHIPPING!